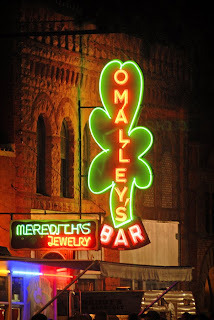 I was in Yankton, South Dakota over the weekend and noticed something I hadn't before - neon. I know there are vintage style neon signs in many South Dakota towns, but for some reason these jumped out at me. There actually are more signs I noticed around town, but I liked these the best for demonstrating my point. If you like them as well, using Yankton as a starting point for a neon photography trip through the southeastern corner of the state will yield a variety of images. Hey Chad, great to see Yankton on Dakotagraph! Did you snap a picture of the Buhl's dry cleaning neon? I think that would fit with this theme. But, more importantly, can you post some photos from Ribfest? We had an absolute blast this year and a huge crowd. I own the brewery on 3rd street and I think I'm just now getting caught up on sleep. And beer. 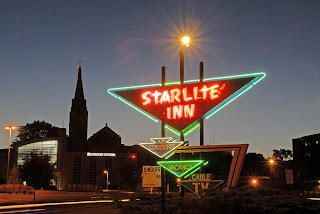 I love when motels still use the old school neon signs. I've been catching myself watching older movies like American Graffiti just for the atmosphere (music, cars, and signs). 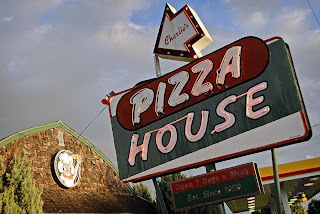 I also love the pizza sign. It looks bigger than the restaurant! Cool pics. Thanks for the comments guys. I appreciate them. Ben - I did take a look at the Buhl's sign, but decided it wasn't as striking as the ones here. Ribfest photos coming right up, thanks for the request. Joe - American Graffiti is one of my favorite movies of all time. I didn't grow up in that era, but did grow up with the movie.